Andrew D. Brosig Photography: Taking the plunge . . . I'm just doing a brief update, even though I know it's been quite a while since my last addition to this venue. I've finally taken the plunge and created a personal website for my photography. Okay, I'll admit. 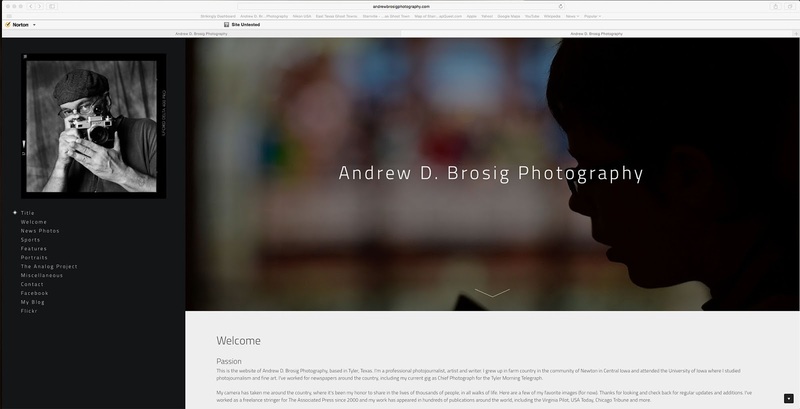 This is a bit of shameless self-promotion for the new site, www.andrewbrosigphotography.com. But what am I supposed to do? I've got to get it out there somehow. I've been working at photography for most of my life. When I started out, the inter-webs wasn't even a gleam of a dream in any inventor's eye. Computers were these massive things that occupied entire rooms and there were only a few of those. Even when computers became household appliances, I resisted the temptation to create a website. Oh, I had one, once, about 15 years ago. It came with the (gasp) dial-up internet service I had installed when I first moved to East Texas. But it was slow and clunky and, honestly, kind of off-putting to people. It took forever to load, had limited space and really didn't display my work as well as I'd hoped it would. Today, though, with a plethora of web hosting companies out there, I decided it was time to take the plunge with both feet. So, this is my effort to get my work out there on the web, hopefully attract some attention and, maybe, some additional work. And don't worry. The Analog Project is well represented. In fact, there's a whole section devoted to the work I've been doing with the old cameras, along side some past, and recent, digital work. I seem to go through phases, dedicated to the blog, then letting it slip for weeks (months?) at a time. By way of total disclosure, part of that recently has been due to taking a new job a few months ago. Since April, I've been Chief Photographer for the Tyler Morning Telegraph. It's a larger paper in a city about 90 miles northeast of Nacogdoches, where I was for a total of 10 years. As things are settling down, hopefully I'll be more diligent with updates, both here and at the new website. That's the plan, anyway. Please keep checking back. Oh, and comment on the website. Anything you like (or don't like). It's still a work in progress.